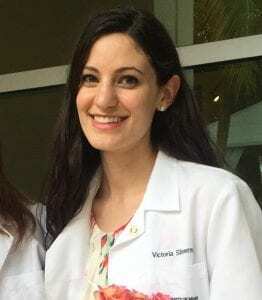 Victoria Silverman is a fourth year MD/MPH student at the University of Miami. She has been involved in AMWA since Spring 2013, when she assisted Past President Dr. Farzanna Haffizulla found AMWA’s Preventive Medicine Task Force, for which she is Secretary and Student Co-Chair. Since then, she has held several leadership roles in AMWA, including Premedical Regional Director, Secretary for the Speaker Subcommittee of the Centennial Programming Committee, and, most recently, she was one of the Student Conference Co-Chairs for AMWA 103. She has received several awards from AMWA, including the Commitment to Excellence Award in 2014 for her continued dedication. She is also involved in the Latino Medical Student Association and is proud to be a Hispanic Scholarship Fund Scholar. She is an aspiring pediatric gastroenterologist with hopes of fusing her love for children, family dynamics, advocacy, and nutrition, but envisions her career as part-time clinical and part-time in public health. She enjoys spending time with her family and spending time at the beach whenever she can!